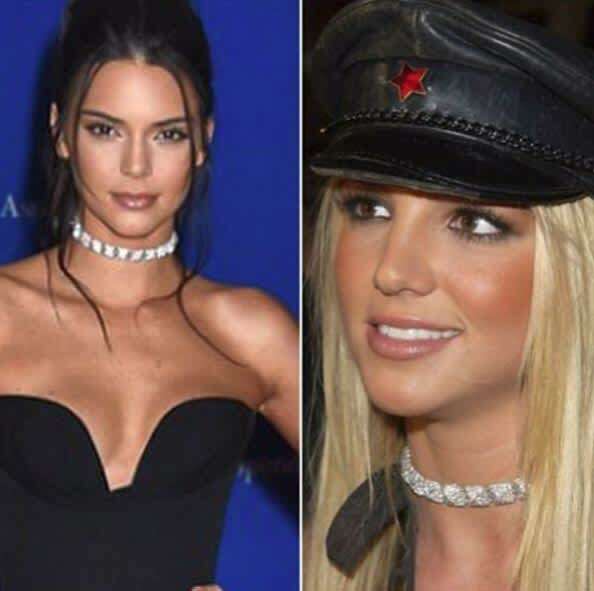 Kendall Jenner channels Britney Spears with same diamond necklace | HELLO! Kendall Jenner took inspiration from none other than Britney Spears as she chose an outfit to meet President Obama on Saturday night. The model sported a diamond stud choker necklace by Lorraine Schwartz to attend the Annual Correspondent's dinner at the White House – a necklace identical to the one that Britney wore to the MTV Video Music Awards in 2002. Lorraine posted a snap of the two stars wearing the sparkling jewellery. "The first one I made in 2002 that #britneyspears wore to the 2002 #vma's to the one #kendalljenner wore to the 2016 #whcd it shows that a #classic is classic forever even if it's a little #funky #goodthingslastforever." Kendall attended the dinner just two nights before the Met Gala. The reality TV star looked stunning at the fashion event, dazzling in a sequinned Versace cutout dress. Speaking about the stunning gown on the night, Kendall said: "I'm excited to be wearing it. Donatella asked me to go with her [and] wear the stuff and I obviously said yes." However, Kendall revealed she became indecisive when she ad to pick between her top two. "She sent me sketches, I picked my favourites," she explained to E! News. "I couldn't pick between two, so I said, 'You pick!'"